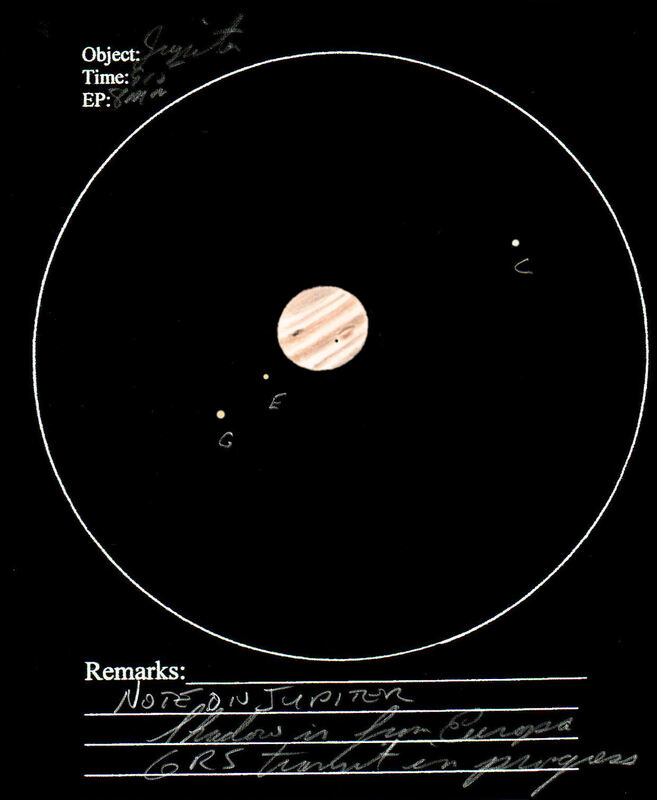 On the night of Dec. 20, 2011 I managed to catch a tansit of the Great Red Spot on Jupiter with the shadow of the moon Europa also tranisting near the GRS. The telescope used was a 120mm refractor at 125x while observing in my suburban Orleans, Ontario, Canada backyard. The sketch was done at the eyepiece and later cleaned up in Paint Shop Pro. The colour was added with coloured pencils and pasted into the reversed scan of the original sketch. Lots to see here in this wide field sketch. Very well done. I love those shadow transits on Jupiter too. Looks like you had excellent seeing conditions. This is great work for a 120mm scope.